What's Really in Dog Food? Fleas are similar to cockroaches in that they adapt to their environment: they become stronger and more immune to popular commercial flea control chemicals with each generation. Moreover, an effective solution must also deal with eggs and larvae that come to life long after adult bugs are dead. In truth, most of the fleas are living in the dog’s environment, rather than on his body: every flea found in his fur may mean that there approximately 30 more living in your home. Fleas are holometabolous: which refers to their complete metamorphosis or change. 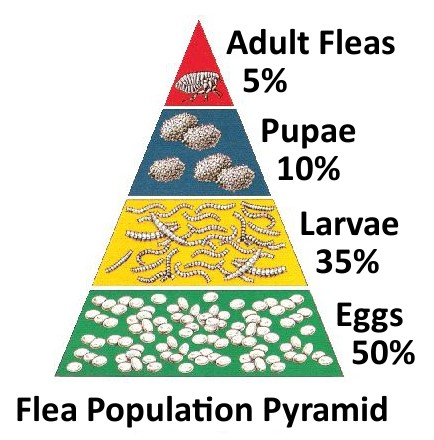 A flea's life span goes through four stages tied to external conditions, and the adult fleas that bite represent only the top, about 5% of the “flea population pyramid” total. Possessing little eyesight, she relies primarily on air currents and carbon dioxide to locate hosts: as your dog passes by, the persistent flea jumps up and down, sometimes thousands of times, before it hitches a ride. Once on board, the flea secretes saliva onto the target area to soften the skin and make the blood flow readily; it is this saliva (not the actual bite) that causes the allergic reactions in pets and humans. After her blood meal, the flea begins laying eggs on your dog: some are removed as he grooms himself; others fall off as he moves about the house. The hibernating cocoon is adaptive and can survive up to year without feeding, awaiting proper conditions (and detection of a host’s vibrations) to hatch and immediately seek a blood meal, thus begining a new generation. Adults can live 1 to 2 months without a meal and can survive 7 to 8 months with just one meal. The wide fluctuation in duration of the various stages accounts for the sudden emergence of massive numbers of fleas in what we know as “flea season”: they've been there all along, waiting for optimal temperature and humidity conditions to occur before maturing en masse. The problem is that many common pesticides used to eradicate these pests kill only adult fleas, leaving almost the entirety of the flea problem behind to wreak havoc many times. Statistically, efforts directed at the eggs and larvae will yield the best results, and prevent future generations from being born. Sightless and deaf, the tick uses olfactory receptor neurons consisting of about 20 sensilla located on their first pair of legs (the Haller’s organ) that are narrowly tuned to the specific odor of butyric acid: a fatty smell emitted by warm-blooded creatures (also contained in sweat). The tick’s skin is photosensitive, and can detect warmth: it directs itself toward such heat, then drops from its perch onto the host (the dog). As “obligate blood feeders,” ticks consume blood and as such, can transmit disease. This most commonly happens when the tick first bores a hole (secreting an anesthetic, so it goes unnoticed), exuding a cementing material (to secure itself), and commencing its first meal. Often the tick regurgitates a small amount of blood from its prior host, and it is in this way that the tick transmits disease, and to which pesticides cannot protect against (see previous page). A female tick will feed for several days, increasing as much as 200 times in weight before she's had her fill; once satiated, she falls to the ground where she lays thousands of eggs which emerge to re-start the cycle. Feeding for only a few days, the majority of the life of a tick is spent off the host in the environment either seeking a host, molting or simply passing through an inhospitable season (e.g., hot summers or cold winters). Ticks that infest dogs include Dermacentor variabilis, the American dog tick; and Ixodes scapularis, the black-legged tick (erroneously nicknamed “deer tick” as a propaganda tool by advocates of recreational hunting). 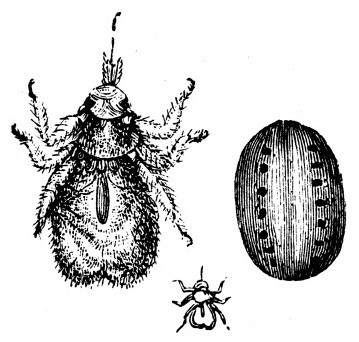 They are known as three-host ticks: since at each stage of life (larva, nymph and adult) the tick feeds, drops off and transforms, then moves on to another host. Controlling fleas and ticks on your dog necessitates ceaseless attention; it's never a onetime or occasional thing, particularly for a dog that may get walked in outdoor areas. But why do some dogs seem to be infested with parasites… while others (even in the same household) aren’t? The answer lies in nature’s plan, and the parasite’s role therein: to weed out and finish off unhealthy members of the various host species. The reason can often be found by comparing the general health of each animals' skin: the fastest-growing organ of its body, with the outer layer of cells being replaced every 3 weeks. Optimum nutrition is essential for healthy skin; improperly nourished, the skin will be the first area to show problems. Dry, unhealthy skin causes itching, as well as more severe reactions to fleabites, as the skin may bleed and actually “fall apart”; under these conditions, fleas need not chew to extract blood… and flock to this host. A strong immune system and high nutrient levels help repel insects: many infestations can be avoided with an improved diet, augmented by an Omega-3 (fish or flaxseed oil) supplement. that uses the least toxic methods first. be more effective than conventional methods that rely on chemicals alone. Setting a threshold to decide when it's time to act. Pyrethrums are natural (organic) pesticide found in a gene of certain species of chrysanthemum flowers. Central Asians discovered that the seed cases of dried, crushed flowers were toxic to insects centuries ago. More recently, during the Napoleonic Wars (1804-1815) this “insect powder” was used to control flea and body lice infestations by French soldiers. Permethrins are synthetic (laboratory made) chemicals based on analogs (chemical structures) of natural pyrethrums. They are “artificial” by definition, because they are engineered: produced from chemical alteration. Permethrins were first developed in 1942 and adapted for agriculture applications in 1973; and subsequently for pharmacy use to fight scabies (Sarcoptes scabiei skin mite) and (Pediculus humanus capitislice) head lice. Permethrins kill on contact when sprayed on clothing. Unlike pyrethrums, permethrins maintain stability when exposed to sunlight and heat, and are used agriculturally on different crops. Permethrins are generally stronger and last longer. However, as broad spectrum insecticides (they kill indiscriminately), they also harm beneficial insects, including honeybees and butterflies, and can be highly toxic to aquatic species (who cannot metabolize them) through their bioaccumulated persistence in the environment. Since the mid-2000s, research has focused on integrating an enzyme inhibitor to disable the insect’s resistance mechanism. Permethrins marketed with language intimating “made from chrysanthemum flowers” are falsely advertised. Pesticide-grade permethrins are fatally toxic to cats. Modern mixtures are of several different compounds of pyrethrins and oily esters called cinerins, which at low concentrations are effective as repellents. Today, pyrethrum is extracted with solvents for insect sprays and typically combined with piperonyl butoxide (PBO: a synergist). Despite its efficacy as low toxicity insect control, pyrethrums are not stable in sunlight and thus are seldom used in commercial agriculture. Pyrethrums are also toxic to honeybees, and so if so used for so-called “organic” farming, are applied at night to avoid typical pollinating hours, and in liquid rather than dust form. Fish and aquatic invertebrates lack the ability to metabolize these compounds, leading to a toxic accumulation of byproducts if exposed from runoff or application drift. Upon acquiring a host, fleas will feed, mate, and lay eggs directly on the dog, continuing until they die or are dislodged. On dogs, fleas are more prone to living near the ventral areas and hindquarters. Fleas are well adapted for moving on hosts: a flea’s flexible, laterally-compressed body allows it to run effortless through host hair without resistance. The eggs are deposited into the haircoat: wet and stick at first, they dry within a few hours, at which point they become non-adherent and fall to the environment. Grooming with a closely-tined “flea comb” can be effective. Slowly stroke the entire length of the dog’s hair-coat, starting with the head and working backwards in the same direction with all strokes. Because fleas can move quickly, most will escape the comb’s path: persistence is key. Most sources suggest combing for at least 10 minutes, adding 5 minutes every time a flea is found; the process ends once fleas aren’t found for 5 minutes. Fleas consume much more blood than they use, and as such, produce copious feces. You may collect black, pepper-like material. To determine if this black material is flea feces, place the debris on a white paper towel and add a drop of water: if it is flea feces, you will see a reddish-brown stain develop, since flea feces is actually partially digested blood. The “flea dirt”, consists of partially digested host blood, drying in irregular shapes that get embedded into fur, until the dog grooms or scratches to free it. Drop fleas into a bowl of soapy water with several drops of detergent added. Don't crush fleas with your fingers since they may be carrying parasites themselves. A bath every two weeks during the season with a mild organic lotion soap will kill many fleas by drowning; it's not necessary to use insecticidal shampoos, as most soaps hold water sufficiently to kill fleas (just let the suds stand a few minutes before rinsing). Afterward, a lemon rinse will tone the cleansed skin, leaving a residual citrus odor that will temporarily help repel fleas. Slice a whole lemon and drop the unpeeled slices into a pint of nearly boiling water. Steep the lemonwater overnight, then strain out the pulp. Sponge the lemon rinse onto your dogs skin and allow it to air-dry (don't towel). This nontoxic treatment can be repeated daily if necessary. (You can make a natural flea shampoo by using one cup of the lemon rinse and one cup of white vinegar added to a quart of water). Having likely already left eggs in the house— a time bomb that goes off months or even years later, given the right temperature and humidity— treating only your dog with insecticide in an effort to keep fleas and ticks out of your home is both futile and perhaps deadly: sacrificing the dog for the sake of its environment. An essay by The Northwest Coalition for Alternatives to Pesticides (The Journal of Pesticide Reform (1997, 2003) discussed 20 popular flea control products: two-thirds of which were neurotoxic, half contained cancer-causing agents, and all posed environmental threat. 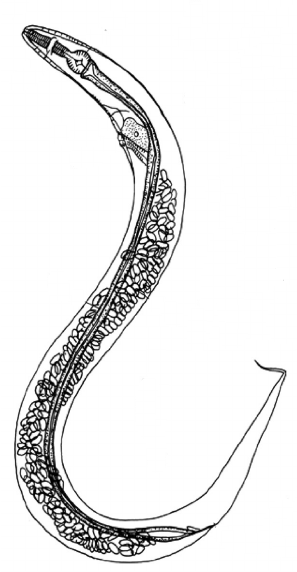 Pyrethrins affect the flow of sodium out of the nerve cells in insects, resulting in repeated and extended firings of the nerves (hyper-excitation), leading to paralysis and death. Pyrethins are identified as non-persistent (biodegradable): they break down on exposure to light or oxygen in the environment. In its analysis, the EPA states that toxicity is generally associated with over-application. Permethrin and other pyrethroids are synthetic versions of pyrethrin which have significantly greater toxicity potential. Many flea control insecticides simply aren’t effective. While flea collars emit continuous micropowder “vapors” into the home (including active ingredients that are known carcinogens, and which your dog ingests, through breathing or self-grooming), they often irritate the skin, merely “chase” fleas to his tail end (as fleas avoid the vapor), and do not affect flea eggs. Aerosol space foggers are promoted with claims of virtual eradication of household pests. But foggers are effective only on exposed adult insects; eggs and larvae are not exposed and, except when the fogger has a persistent ingredient (a long half-life), there is no residual toxicant to contact the insect when it is vulnerable. For a severe flea infestation considered an emergency, it may be fair to decide that there is no alternative than a commercial “fogging” insecticide to eradicate the adult fleas, before a natural-insecticide program can be undertaken. Taken as a last resort, while justified, remember that chemicals may remain residually active for weeks afterward. At least ensure that the “active ingredients” are natural pyrethrins, and call the manufacturer’s toll-free line to seek information regarding the “inert” (non-listed) ingredients are: if they can’t (or won't) tell you, it would be prudent to bypass that product. Having made the decision to use the fogger: prepare the room by moving furniture and clutter away from walls and baseboards, so that the fog can penetrate efficiently. You should remove all animals both for the procedure and minimally, several hours afterward. A diligent, ongoing natural flea-control program should preclude the need for further chemical “fogging” in your home. 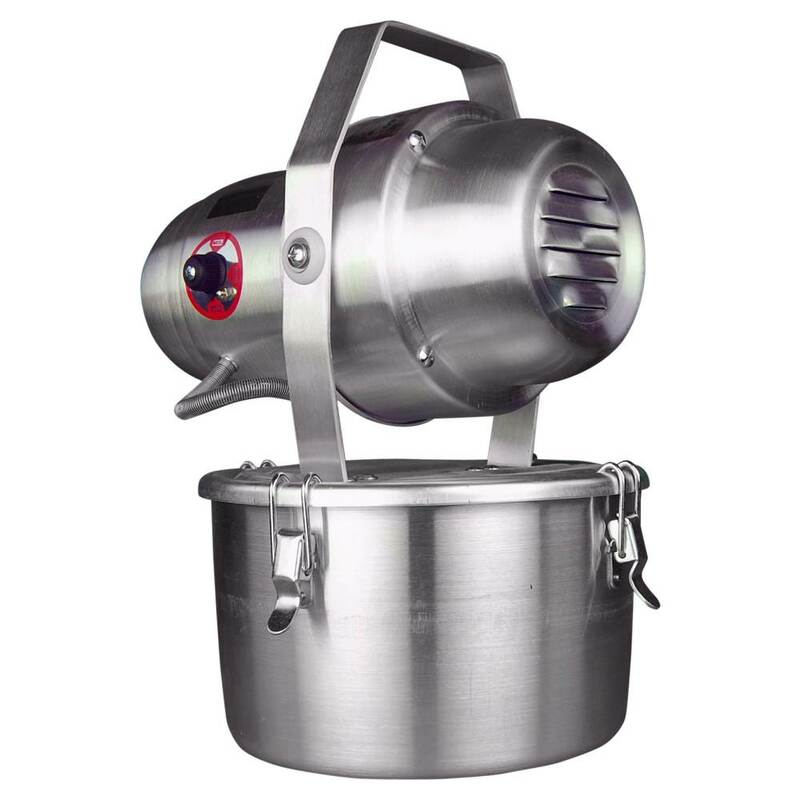 A safer and more effective alternative is a chemical-free non-thermal turbine fogger/fumigator, which drives atomized biodegradable non-toxic cedar oil throughout the target areas, more thoroughly, and with less preparation. is the most effective "Treatment"
Since larvae wrap themselves around the base of carpet fibers, and hang on, vacuuming may be only partially effective in removing the flea larvae in carpeting. But vibration from vacuuming can result in the emergence of adult fleas from the pupal stage, and the newly hatched fleas may be removed prior to ever meeting your dog. After vacuuming, the cleaner bag (or permanent cup, if a bagless unit) shouldn't be left in the machine: since the fleas may escape and the eggs it contains can hatch and re-infect your house: throw it out (or at least keep it outside between uses) or otherwise destroy the contents. For severe infestations, a professional steam cleaning is in order. Vacuuming is important since flea larvae feed on non-viable eggs and feces from active adult fleas. In 6 – 14 days the larvae develop through three stages prior to spinning cocoons so that they may become pupae, (at which they simply await (perhaps for months) ideal conditions to emerge. Larvae avoid sunlight, burrowing deep into carpeting and seeking dark crevices in floors or along baseboards. Although larvae can survive a damp mopping (cocooned adults can survive immersion in water), its still useful, since water dissolves flea feces, and so deprives them of a food source. Pre-emergent adult fleas will emerge if provoked, most particularly by detecting a worthy host to feed upon: and the heat and pressure within the dog’s bed (where they likely drop off the dog originally) triggers the process. Often forgotten is the family vehicle: if the dog gets in, it should be vacuumed thoroughly and repeatedly. 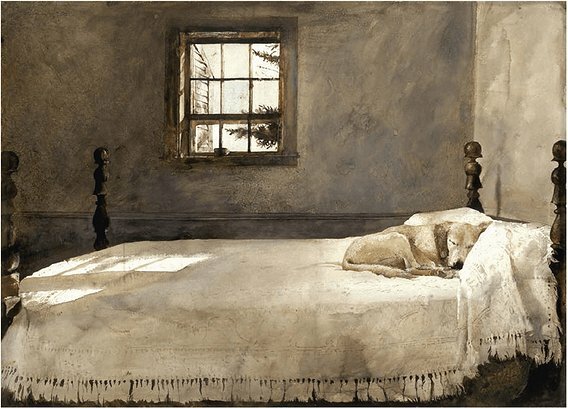 Fleas will accumulate where dogs sleep. Restrict the dog's access to difficult-to-clean areas like basements and attics. If possible, establish a single, regular sleeping place with fresh bedding that is easily removable and washable; covering his “bed” with a sheet or towel is beneficial. To break the flea life cycle, schedule washing at least once a week. Pick bedding up by the four corners so that eggs and larvae aren't scattered throughout the area; don’t mix it with other laundry, and polish off any six-legged survivors with a dry at “hot” setting. When you re-make his bed, sprinkle diatomaceous earth (see below) on the clean bedding, carpets and floors, working it in with a broom; cedar oil powder (see below) under the bedding is especially effective. For carpeted areas, boric acid (hydrogen borate: nontoxic borate crystal salt) dissolves the waxy protective coating (exoskeleton) on fleas, eggs, and larvae, causing them to dessicate (dehydrate), effectively targets flea larvae on contact, yet has extremely low toxicity to dogs; (troublesome only if directly inhaled, or, around a dog with wounds from existing dermatitis). Shake the product onto the carpet and work it in with a broom. The extremely fine particulates can remain in the carpet, even after vacuuming. As its killing action is mechanical, not chemical, fleas cannot become immune to its effects. Note that “boric acid” is not the similarly sounding sodium polyborate powder (a commercial product), nor 20 Mule Team™ from the grocery store; neither the hand soap Boraxo®, (of which the added soap can be toxic to dogs). Heat is indicative of a warm-blooded host, and will stimulate and attract fleas: you can suspend a bare bulb 6-12 inches over a pan of water with some dish soap added: surfactants in the soap reduce the water’s surface tension, causing the fleas to sink and drown. However, the light itself is important: even though fleas will orient themselves toward heat, absent further stimuli, they will not jump to a host (or the trap). Fleas primarily use visual cues to locate hosts. With only a single biconvex lens in each eye, fleas lack acute vision; but have adapted to sense changes in light intensity. Adult fleas are positively phototactic (they are drawn to light sources): researchers have demonstrated that if placed in a dark area, 93% of fleas move to a lighted area within 40 minutes. Adult fleas climb objects or congregate near openings that allow light in (doorways) so that they can orient themselves towards lighted areas while waiting for a host. An effective IPM exploits this phenomena. Fleas can can jump 8 inches (hundreds of times their height) and 13 inches horizontally; and detect light wavelengths between 300 and 600 nanometers (nm), but are most receptive to wavelengths between 500 and 530 nm, a green-yellow colored light. Commercial lighted flea traps fitted with a green-yellow filter will attract twice as many fleas as a standard/LED bulb. Also, fleas are most attracted to lights that are briefly turned off (10 minutes on, 5 seconds off): most fleas move only a short distance toward an uninterrupted light. Fleas jump once the light is turned off or blocked: they interpret the break as a host walking in front of the light, and they move toward the perceived shadow, as the light going off simulates a moving a host. Thus, flea traps are more effective at night, and traps employing intermittent light consistently capture nearly eight times more fleas than a light that is continuously on. skeletal remains of diatoms remain effective as long as kept dry and undisturbed. Once your home is sanitized, defend against a recurrence of fleas by applying small amounts of “food-grade” diatomaceous earth (DE) throughout. 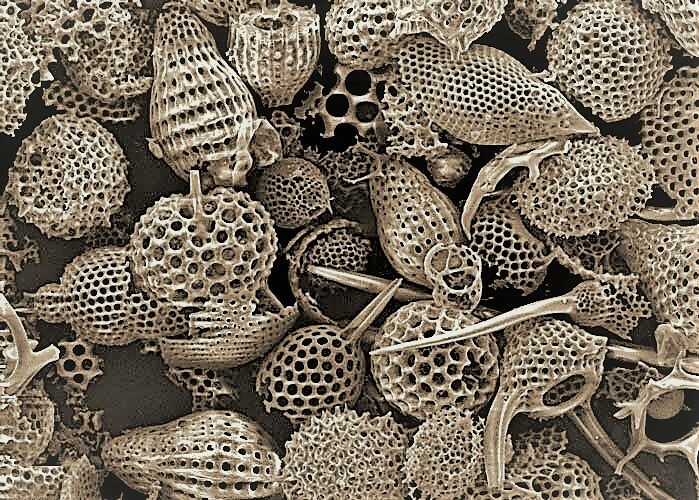 Appearing similar to baby powder, diatomaceous earth is diminutive fossilized skeletal remains of diatoms: unicellular acquatic plants: a major group of algae, and a common type of phytoplankton. The skeletons are made of a natural substance called silica. Over a long period of time, diatoms accumulated in the sediment of rivers, streams, lakes, and oceans, and silica deposits are mined from these areas. Silica is very common in nature and makes up 26% of the earth's crust by weight. Various forms of silica include sand, emerald, quartz, feldspar, mica, clay, asbestos, and glass. Silicon, a component of silica, does not exist naturally in its pure form, because it reacts with oxygen and water to form silicon dioxide. Silicon dioxide has two naturally occurring forms: crystalline and amorphous; most commercially available diatomaceous earth is made of amorphous silicon dioxide, but can contain very low levels of crystalline silicon dioxide. The first pesticide products containing silicon dioxide (diatomaceous earth) were registered in 1960. The microscopic, razor-sharp edged particles of DE attach and absorb oils and fats from the cuticle (the waxy protective outer coating) on the flea's exoskeleton, leading to dessication (dehydration) and death. The most common formulation of diatomaceous earth is as a dust. It only takes a small amount of DE a large area indoors if it is strategically placed near problem areas such as under the baseboard heaters, beneath the stove or cupboards, near the sink, garbage, etc. Effective on carpeting, if sprinkled on bare wood floors DE will drop into cracks and crevices favored by fleas. DE remains effective as long as it is kept dry and undisturbed; it can be accidentally sucked up when vacuuming, so reapplication may be necessary after ordinary cleaning. Non-toxic, DE can also be rubbed directly into your dog’s fur. You should continue application of diatomaceous earth after the resident flea population is exterminated, because hibernating fleas in the cocoon stage may survive in the home environment up to a year without food. This stage can survive most chemical treatments and can emerge to reintroduce the flea population. Diatomaceous earth for pest control should not be confused with “pool grade/pool filter grade” diatomaceous earth, which is treated with heat, causing the formerly amorphous silicon dioxide to assume crystalline form which is not effective for insect pest control, and can be toxic to dogs. Pine pitch has been used for centuries by many cultures globally as a general-purpose repellent and killer for biting insects, and by Native Americans as a repellent and for antiseptic purposes. But it is very high in turpenes (essential oils of conifers), which can be toxic to the respiratory and central nervous systems if inhaled, and the renal system if ingested. Biting insects such as mosquitoes, chiggers, fleas, ticks, head lice, and bed bugs are killed on contact; and cedar oil effluvium repels wasps, yellow jackets, and most arachnids. Solid cedarwood blocks are used to repel moths from clothing (for which it was first EPA registered in 1960) and retard mildew growth on fabrics. Pure cedar oil has a strong smell whose odor, but not effectiveness, evaporates in a brief time. Many families send cedar oil sprays as care packages to US Army posts in the Middle East to protect soldiers and their service dogs against sand fleas, scorpions, biting flies, and venomous snakes. As a spray, it is used agriculturally to repel flies and knats from horses and cattle, in granular form to control soil-borne insects in stables, and as a closed release dispenser to repel moths from clothing. On the consumer front, cedar oil is available as a personal or home trigger spray, as concentrate for dilute spraying through a compression garden appliance or hose-end attachment, or as granulated repellent pellets. Cedar oil acts as a pheromone interruption agent that shuts down the insect’s breathing system. Lacking this effect toward humans or animals, it is non-toxic, and can be applied directly to the dog as a contact killer and to provide natural repellency; it does not wash off with water and can last several weeks, (rain even refreshes its activity: signified by the fresh smell of cedar on his coat). Used for home eradication or yard spray, pets can be returned to the treated areas in a short time and the process can be repeated whenever desired without chemical residue or build-up. For residential applications, forms include sprays (the dog and house), powders (his bedding), and granules (lawn borders). For severe flea and tick infestations, or, in cases where de-cluttering is difficult, solutions include a low volume chemical-free fogger that uses a turbine to thrust an atomized solution of cedar oil and melted quartz rock (acting as a carrier) as a cold dry mist which can penetrate into cracks, behind furniture, through jumbled basements and clothes-filled closets, outside house perimeters and yard areas, etc. ; and which is ideal for fumigating disorderly areas such as basements and attics, with a fog-drift of up to twenty feet. As such, cedar oil can be an ideal non-persistent fumigant for repeat applications, or for large-scale de-infestation projects (industrial applications, hotels, etc. ), as an alternative to commonly used (but hazardous, and regulated) Bromomethane, (methyl bromide) pesticides. In many respects, the simplest and most effectie preventative will mask the specific odors on your pet that pests are searching for in the environment: if the formula is effective, fleas and ticks cannot smell, taste, or even identify the host they're seeking. Many herbal or natural remedies can work just as well as chemical solutions. Many dogs seem to benefit from the addition of garlic and nutritional or unprocessed brewers yeast (Saccharomyces cerevisiae) to their diets. When metabolized, an odor (and bitter flavor) that fleas and ticks find very unattractive develops in the skin. The odor betrays the allicin content in garlic, a phytochemical (a naturally occurring biologically-active enzyme, that is produced when the plant is attacked or injured) which is toxic to insects. The important flea-control ingredient in brewer's yeast is thiamine (vitamin B1), which concentrates in the skin and can repel fleas. Overdose of garlic can cause anemia, and some dogs are yeast intolerant if consumed orally, reacting with a skin allergy to excess pyridoxine (vitamin B6), so advice from a holistic veterinarian regarding proper dose is important. Better than mixing ingredients yourself, one prepared by a vet or a commercial product would have appropriate proportions of the two already established, according to the dog's weight. Zinc, essential for healthy skin, but lacking in many pet’s diets, is often added to commercial products (chelated zinc is more readily bio-available for absorption). This supplement will require several weeks to build up to fighting levels in your dog’s skin, so start before peak flea and tick season begins. For dogs unlikely to excessively groom themselves, some guardians use brewer's yeast dusted on externally as a flea powder. A mildly controversial “technology” offered against biting pests is magnetic tags that attach to a dog collar (or a farm animal’s harness). Worn in pairs (one each: for fleas and ticks) magnetic tags add to the dog’s external bio-energetic field with specific frequencies proven to disturb fleas and ticks, creating a barrier. Although dismissed by many as wholly ineffective, the tags are used in agricultural environments and have enthusiastic advocates, claiming effectiveness for up to 2 years. Established but disputed technologies include ultrasonic pendants that emit a series of ultrasonic (high frequency: more than 20,000 HZ) sound waves that are supposedly imperceptible to the dog, but which are intolerable to fleas and ticks, repelling them for the life of the battery: said to be about 12 months. Consumers should expect validation: in 2001, the US Federal Trade Commission (FTC) sent a warning to manufacturers of ultrasonic pest control devices (at that time, indoor rodent targeting devices), demanding that claims of effectiveness be supported by scientific research, to avoid violations of federal consumer protection law. Metal tags containing silicon dioxide particles that are encoded with frequencies that are emitted over time, as a repellent to fleas, ticks, mosquitoes, and other biting insects. Secondarily, once the tag is removed from its electro-magnetic shielded envelope and attached to the dog's collar, “encoded frequencies will synchronize with your pet's own unique biological frequency,” repelling fleas, ticks, mosquitoes and other biting insects. The tag builds to an efficacious level in about two weeks, supposedly effective for a year. As a homeopathic principle (see below), the process operates with distinguished frequencies of quantum mechanics (or quantum physics), the science which describes nature at the smallest scales of energy levels of atoms and subatomic particles. Quantum theory gradually arose from theories to explain scientific observations which could not be reconciled with classical physics. Quantum mechanics explains the features of our universe, and is perhaps the only tool available that can reveal the individual behaviors of the subatomic particles that make up all forms of matter (electrons, protons, neutrons, photons, and others). Quantum mechanics has strongly influenced string theories, candidates for the reductionist Theory of Everything, and critically important for understanding how individual atoms combine covalently (chemical bonding formed by the sharing of electrons between atoms) to form molecules. Still, studies found dose-related impairment of thyroid function and hepatotoxicity in animals: (Panda S and A Kar., How safe is neem extract with respect to thyroid function in male mice? Pharmacological Research, 2000;41(4):419-422). It is also essential for awareness that not all “natural oil” remedies are safe. Example: pennyroyal oil is often suggested as a flea remedy for domestic animals, despite being well documented for imparting serious hepatic and neurologic injury (nausea, vomiting, respiratory difficulty, gastrointestinal bleeding, seizures, and coma, followed by coagulation abnormalities, disseminated intravascular coagulation, massive hepatic necrosis, and death). A skin rub can be made from a half-tablespoon of virgin, un-refined coconut oil diluted with water into a spray before setting out for a walk. The oil contains lauric acid, a medium chain fatty acid found in “mother’s milk” that boosts the immune system against bacterial and viral infections. It has known natural effectiveness as a flea, tick, and mite repellent, with the added benefit of skin and coat conditioning. Coconut oil can also be ingested, by adding 1 teaspoon per 30 lbs. of body weight mixed into food, augmented by brewer’s yeast (as a repellent, but the oil has natural antifungal, antibacterial, and antiviral properties and helps expel or kill intestinal parasites). A spray for misting the dog (or furniture and pet bedding) can be a white vinegar solution: 3 parts water/1 part white vinegar, with a few drops of tea tree oil. Alternatives: Lemon, salt and vinegar spray; boil several lemons in water with a few tea spoons of salt. Once cooled, add one table spoon of apple cider vinegar. Spray it onto the dog’s coat and leave it to dry naturally. Apple cider vinegar, salt and baking soda spray: 8oz. vinegar, 4oz. warm water, ½ tbs. salt, ½ tbs. baking soda (spray it onto the dog’s coat and leave it to dry naturally). Unpasteurized apple cider vinegar (about a teaspoon added to his daily drinking water) supports the immune system, or, add two cups to his bath water. Quassia is a flora genus in the family Simaroubaceae. Its breadth is disputed; some botanists regard it as consisting of only one species, Quassia amara from tropical South America, while others use a wide circumscription as a pantropical genus containing up to 40 species of trees and shrubs. 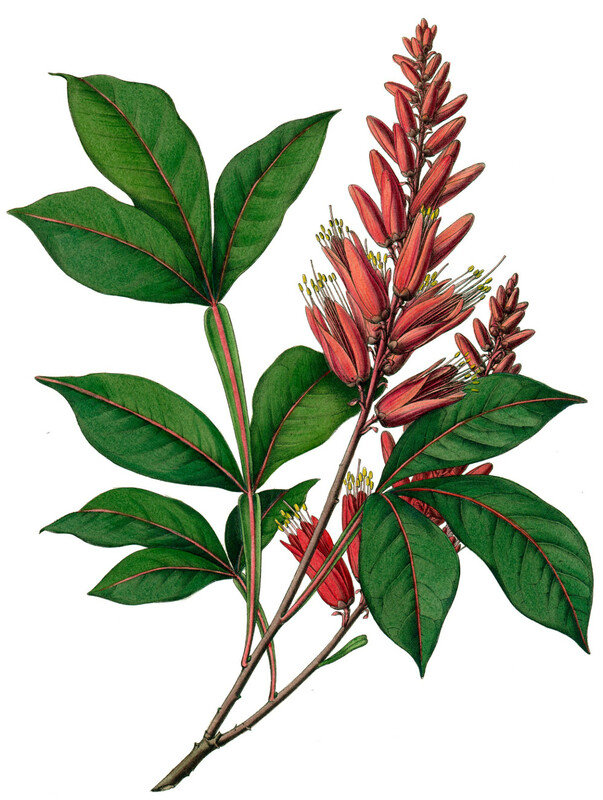 The genus was named after a former 18th century slave from Surinam, Graman Quassi, who discovered the medicinal properties of the bark of Quassia amara (also known as: Amargo, bitter ash, and bitter wood). Amara extracts have shown effectiveness as a contact-insecticide (the insect must be sprayed) and antiparasitic. Extracts of plant wood or bark have been known as a natural insecticide and larvacide in organic farming environments. A commercially prepared “herbal spray,” (which is rubbed into the skin to assure coverage), combines sispanga, sacha café, and sisopanga rojo. It can last up to several weeks (depending on the dog’s activity). An oral tick preventative that is added to the dog’s food is claimed to last 2-3 months after a 5-day dosing, and combines larrea mexicana, chapparel leaf aromatica, Oregon grape root quassia amara, quassia tansy, and thyme vulgarus. Aromatherapy, or essential oil therapy, can be defined as both an art and controlled science of utilizing naturally extracted volatile aromatic essences from plants to balance, harmonize and promote the health of body, mind and spirit. As a holistic practice (that is: relating to or concerned with wholes or with complete systems rather than with the analysis of, treatment of, or dissection into parts, an ecological view of humans and the environment as a single system), this homeopathy seeks to unify physiological, psychological and spiritual (energy) processes to improve develop an individual’s innate healing process. Holism therefore incorporates concern for physical, intellectual, emotional, and spiritual aspects of the body. The term “aromatheapie” was created by a French perfumer and chemist, Rene- Maurice Gattefosse, in his 1937 book “Gattefosse’s Aromatherapy,” which described early clinical conclusions for utilizing the antibacterial, anti-inflammatory and analgesic effects of aromatic essential oils for a range of physiological ailments, and distinguished the therapeutic application of essential oils from their perfumery applications. These highly volatile oily substances to which the plant owes its perfume and flavor, are present between the cells and act as plant hormones, regulators, and catalysts. They may be considered as representing the vital elements or life force within the plant. Extraction methods are of utmost importance with purity being imperative in order to obtain good therapeutic results. Aromatherapy requires an extremely high quality of essential oils. Synthetic substances cannot replace the real product. There are hundreds of chemical components in essential oils. Most of them are in minute quantities, and yet it is the precise combinations and ratios of elements which render each oil powerful. As a result, solvents or preservatives are not used in the preparation of first-quality essential oils. A steam-distillation method of extraction is used instead. This process consists of sending steam throughout the plants, which evaporates oils. The steam is then condensed and the oils separate from the water. This method yields a high quality oil. The best oils come from wild organic plants. The amount of oils found in each plant varies greatly and this is reflected in the price. Aromatherapy has been used for thousands of years and its various uses for healing and spiritual ritual was a sacred practice in many traditional cultures. In the Antiquity (3300 BC: during the Stone Age), doctors used primitive forms of herbal medicine. But the roots of Ayurveda, ancient India's indigenous system of medicine—combining Sanskrit words ayur (life) and veda (science or knowledge)— have been traced even earlier, perhaps to around 4,000 BCE. And so, thousands of years before modern medicine provided scientific evidence for the mind-body connection, the sages of India had practiced sophisticated versions of it through the use of essential oils to harmonize the psycho-physical constitution, and improve brain clarity. According to Ayurveda, herbal ingredients may be prepared as natural incense, and used to prevent infections, purify one's environmental atmosphere, and provides a pathway to connect and energize vital “life airs” of the body. The second oldest continuous practice of medicine in the world is the traditional Chinese system, with its focus on the Five Element fundametals of ayurvedan medicine fundamental to the energetic classifications of nature and matter: the principles of inertia, cohesion, radiance, vibration, and cohesiveness. As an example of the holistic view, Ayurveda identifies three doshas within each person, each of which has unique characteristics. The dominance of one of the doshas affects a person’s temperament, the diseases that can affect him and even governs how he react to stress. Apart from that it also dictates the type of body structure he has and the foods he is likely to love. In Europe, the use of incense (fumigation aroma therapy) was considered to be of primary importance as far back as the time of the Greek physician Hippocrates of Kos (460 -370 BC), used as respiratory tract decongestants, for embalming and anointing, and most particularly for relief of emotional and mental disturbance. Two principle methods of administering the healing systems, fumigation and inhalation, are easily achieved through the use of herbal scents. The Ancient Egyptians have documented their utilization of natural oils from around 3,500 BC. Some of the ingredients that Egyptians used therapeutically were spikenard, frankincense, citrus fruits, myrrh, oregano, and cedar. Some scholars believe that a spikenard ointment may have been used by Mary Magdalen to anoint the feet of Christ prior to the Last Supper. It is believed that ancient Egyptians were the first to extract flower essences, and as such, the first perfumers in history. Essential oils are extracted either through distillation (including hydro, or steam distillation) or expression. The latter refers to cold pressing, specific to citrus essential oils. Originally done by hand, today the Écuelle à piquer process involves a prodding, pricking, sticking action to release the essential oil from the rind of the fruit. Because they contain nonvolatile residues, distilled oils have a longer shelf life and are less photosensitizing than expressed oils. Absolutes oils are extracted with chemical solvents (Enfleurage) that are later removed during the final stages of production, although trace amounts ofsolvent can remain in the final aromatic absolute. Modern aromatherapy finds carbon-dioxide extracts available, however, these differ in chemistry from their relate distilled essential oils. The concentrated volatile essences (oil) steam distilled from leaves of the eucalyptus tree can augment bath water as a natural deodorizer and flea & tick repellent, incorporated into conventional shampoos, or misted onto his bedding. A light-scented oil steam distilled from the flowers of Lavandula officinalis. Further to its medicinal benefits, lavender has a delicate and beautiful fragrance, known for its calming, anti-depressive, effects on dogs, and incorporated into shampoos or spray, can be used to repel fleas and ticks. Of the two varieties of rose geranium oil Pelargonium capitatum x radens. The more popular oil under the name Pelargonium graveolens is from the same family, but not the same species. If used in small doses, does not need to be diluted; dogs have such sensitive smell that they may be annoyed: one drop behind each shoulder blade and one drop on the tail has been described as an effective tick repellent, or rubbed into a bandanna that can be wrapped around the dog's neck. A monoterpenoid, extracted from geraniums and lemongrass; a primary compound of rose oil, palmarosa oil, and java-type citronella oil. An effective repellent, plants destined for commercial oil production are grown specifically for their higher concentration of oils and generally come from, Nepal and Southeast Asian countries. Bursera graveolens (Spanish: palo santo, or “holy wood”), the essential oil of wild South American tree bark. Users report success making an herbal flea/tick collar: 2 tablespoons almond oil with Rose Geranium Oil or Palo Santo, dabbing a few drops on the dog’s neck area (or directly on his collar). Cymbopogon martini, (flea repellent) a grass of chemotypes or varieties, Motia & Sofia, of slightly differing aromas and which may be substituted depending on the demand of the market. The essential oil is steam distilled before flowering. The main constituents are geraniol, geranyl acetate, dipentene, linalool, limonene, and myrcene. Smells like rose oil, and is often adulterated with it, since it is cheaper. Salvia sclarea, oil steam distilled during flowering, a biennial or short-lived herbaceous perennial in the genus Salvia (flea repellent). Steam-distilled leaves of LEMONGRASS OIL, CINNAMON OIL and WINTERGREEN OIL formulated as a spray or wipe are well-known as effective repellents. However, avoid any product blended with Pennyroyal Oil, since while effective—and often listed as a remedy for the purpose—has been shown to be highly toxic to dogs. Essential oils should always be used diluted, even when just inhaling. Careful dilution is essential: commercially available pre-diluted solutions offer a safer alternative for the amateur. And diluting doesn't mean that they can be added to food or drinking water, since ingesting the oil can be toxic. Outdoors, fleas are highly susceptible to fluctuations in temperature and moisture. They prefer damp environments, but are vulnerable to drowning: flood the lawn, then mow infested lawn areas short, and allow summer sun and breezes to dry it out. Studies have shown that removing dead plants, leaf litter under shrubs and trees, and discontinuing mulching flower beds can also significantly reduce tick populations. Creating a 30" gravel/traprock strip will act as a barrier to your lawn, as it will be too hot for ticks to survive crossing. Although absolute accuracy is questionable, you can identify tick infested areas of your yard by making a tick drag, an accepted scientific survey method: tie a couple of yards of cotton muslin to a stick and drag it over suspected areas. Many of those ticks waiting with outstretched legs will show up on the cloth; treat the cloth with cedar oil, or otherwise dispose of it (laundering will not "drown" ticks) to eradicate those that you do find. Planting lavender, peppermint, lemongrass, and geraniums around the home and in the yard will help keep fleas and ticks out of the area. Spray non-toxic cedar oil with a garden hose sprayer or an available fogging device on and under decks, along building foundations, on the outside walls of the home, on any wood, brick, or stucco surface up to the soffits. As a rinse it will wash away insects living around or under siding and trim. Flower beds, shrubbery, patios, stairways, tool sheds, swing sets, sandboxes, compost piles, and outbuildings can be sprayed without harming them; earlier applications are revived by rain. Cedar oil as a yard spray has no adverse effect on beneficial or pollinating insects (butterflies, honeybees), which are sight-driven rather than pheromone-driven. Nematodes are microscopic worms that eat flea larvae and are therefore a natural way to control flea populations. They are available at pet and garden stores or online. Using a lawn sprayer, (ideally after a rain has soaked the ground), put them in moist, shady spots near your house, and within 24 hours the resident flea population can be reduced up to 80% depending on area sprayed. As nematodes multiply rapidly, you have only to introduce a small initial number to have residual benefits (who last between 4 and 8 weeks individually). Flea control nematodes, however, are not uniformly effective in all outdoor environments; though research is inconclusive, evidence suggests that nematodes are most effective against fleas in moist, sandy soils (neither fleas nor nematodes survive in hot sun). Cold winter weather will cause nematodes to become dormant and decline, (necessitating a re-introduction the following spring); and also, as a biological control need to be reintroduced periodically: because they eat all the prey species and die off for lack of food. You can feel your heart start to glow. Healing your wounds and mine. And I will make you whole. And you will conquer your fear. N.B. : This essay is written for informational purposes. Our goal is to build awareness of concepts and define common terminology to stimulate creative thinking, so that you may effectively conduct your own research. We draw your attention to concepts, issues or authors that are or may be important to the subject at hand, but do not consider that our interpretation is necessarily complete. Web links in the text to products are illustrative only and should not be considered an endorsement. This essay is by nature, narrowly focused: there are numerous scholarly writings, as well as detailed EPA web pages, on this topic; which we encourage you to seek out. The current administration is, however, dismantling EPA pages and they may not be available. We are not medical or legal scholars and claim no expertise or give advice. This essay is focused on products meant for dogs: it is important to remember that, WITHOUT EXCEPTION: PEST CONTROL OR MEDICINE PRODUCTS INTENDED FOR DOGS SHOULD NEVER BE USED ON CATS. consider volunteering at a shelter. can provide comfort while he waits. To think about: American taxpayers spend more than $1 billion annually to fund municipal animal shelters. why are they called shelters? (2019) Fairfield Beach Access: all applicable rights are reserved by the site owner.